Ronda de plata Bastet Diosa Egipcia del Gato Monarch Precious Metals de 1/2 oz We'll offer you the lowest price on the internet, when you order your ½ oz Monarch Precious Metals Egyptian Cat Goddess Bastet silver round from our online store today. Monarch Precious Metals is acclaimed for their artfully unique skill in silver minting, evident in this offering, featuring the Egyptian Cat Goddess Bastet. The obverse feature is an exquisite rendering of the Goddess Bastet, just as she may have appeared in a temple relief, this high relief design is surrounded by a decorative border and complemented by a field of hieroglyphic designs and breathtaking, “antique' texturing. This magnificent spectacle is uninterrupted by other stamps or values, so that the coin's obverse could easily pass for an example of coinage from millennia gone by. The reverse feature, which has also been given the “antiquing” treatment, is the Goddess Bastet in feline form, shown within a decorative border and upon a field of hieroglyphic design. This imagery is joined by details of only the coin's metal content, weight and purity. 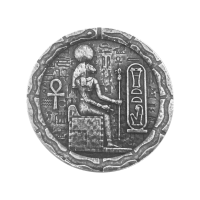 Various techniques have been employed to give this round the look of a relic of ancient Egyptian token, such as an antique patina and anti-polish, not to mention the painstaking high-relief process employed by Monarch Precious Metals. Celebrate the rich symbolism of ancient Egypt and fortify your holdings with a ½ oz Monarch Precious Metals Egyptian Cat Goddess Bastet silver round today!